Most organizations today understand that a disaster recovery (DR) plan is essential to their continued survival should a natural disaster occur. But implementing a drplan entails substantial time, effort and cost - not to mention significant investment in developing new areas of technical expertise within the organization. 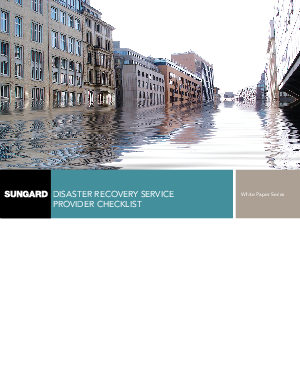 As aresult, many organizations are turning to disaster recovery service providers (DRSPs) to offload their disaster recovery operations. This whitepaper describes what organizations should look for to ensure that the DRSP they select not only provides high quality service and expertise - but also meet their specific business requirements.